Fic/Art: To Touch the Stars, John/Rodney. NASA AU. Pairing: John/Rodney mentioned, established in series. Summary: An interview with Jinto Hallingson. Notes: Alternate Universe (NASA), Art. Additional Note: Written for this prompt on comment_fic. Click for larger readable image. I knew you'd do something awesome with that prompt! So good. I love these kinds of fics, but I am completely unable to pull them off. The amount of cursing that went into this was staggering. I haven't done art of any kind for fic/fandom/fun in so long that I didn't even have PSP on the comp anymore, and oh my god, my skills are so rusty. I wanted to do a manip of John's head onto a suited astronaut's body, but that'll have to be in the future. In other words, I'm glad you liked it. Thank you. :D And you're such a brilliant writer, I think you could pull off anything. Wait. What the...? OMG! This is so awesome! Not just a fic, but a magazine layout! ::claps hands:: Woo! I love this! 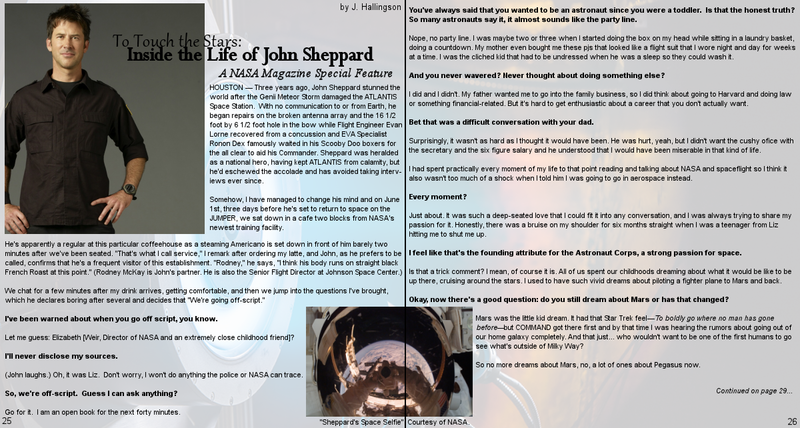 I love John's dedication to his dream, his unwavering desire to be an astronaut. Yes! Yes! This is all I wanted and so much more! Thank you! Thank you! Yay! You're welcome, I'm glad you like it! XD I think I stopped and started it about six times before this got in my head and then all I could think about was John telling someone that he was the kid doing pretend countdowns with cardboard boxes.